Touch ID is an undeniably convenient feature of the iPhone and iPad, allowing quick access to the device simply by placing a registered finger on the Touch ID sensor, which reads the fingerprint to gain access. While Touch ID is useful, some users may later decide they want to disable the feature on their iPhone or iPad, whether for security or privacy purposes, or for another reason. 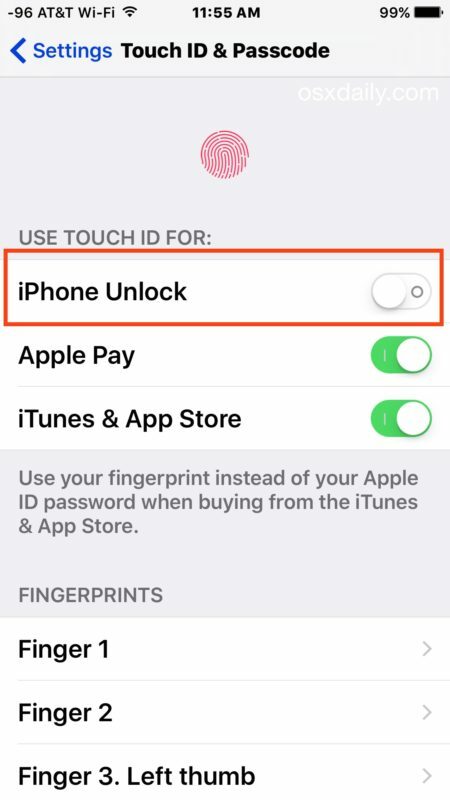 Note this method completely disables Touch ID if desired, but you also can specify to turn off Touch ID for unlocking the iPhone or iPad, turning off Touch ID for Apple Pay, and disabling Touch ID for App Store and iTunes purchases as well, or choose to leave it on for some functions while disabling it for others. Note that if you disable all forms of Touch ID, you may want to remove fingerprints from Touch ID as well, though that is not mandatory to simply turn off the feature. If you are going to disable Touch ID completely, or even just disable it to unlock and access the device, be sure you have enabled a passcode in iOS to prevent unauthorized access. If you’re turning off Touch ID because you find it to be unreliable, you may want to just go through the process of adding another fingerprint or two. This is particularly true if you’re having weather related issues, try adding additional fingerprints of the same finger, which can greatly improve performance in cold weather where skin gets dry, and in humid weather too. 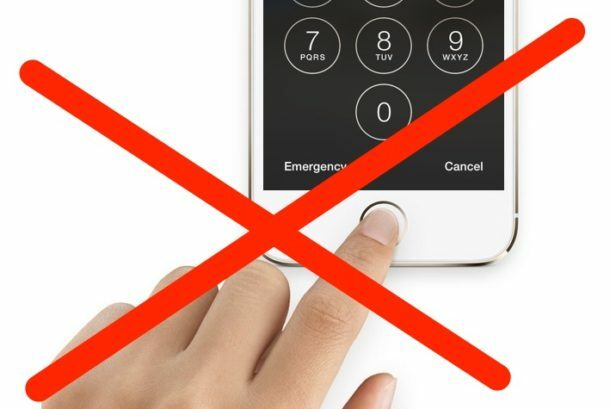 You can also remove fingerprints if you no longer use a specific digit or appendage to unlock the device as well. Don’t forget that you can always reverse course on the iPhone or iPad and setup Touch ID for unlocking again if you decide to use the fingerprint authentication again in the future. It would be helpful to know some of the reasons. Is this feature unreliable in some way that’s not immediately apparent? 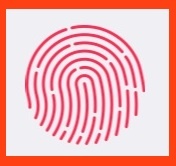 Touch ID is perfectly reliable, it work well for unlocking your iPhone and iPad using your fingerprint. Once you unlock the iPhone with your fingerprint, you have complete access to all of your messages, phone calls, emails, bank information, notes, pictures, web history, etc. And there lies the potential for a problem. The main reason most people might want to disable Touch ID is for privacy purposes. This subject and related others frequently come up in the news in increasingly curious ways. The main reason I want to disable both TouchID as well as Passcode is because i want KIDS to use the ipad. Anybody who walks in the door should be able to use this electronic fun pad. Don’t want them buying apps or reading your emails? Easy: Don’t log in to icloud or google on it, period. Also, pretty glad I’m not in a country making laws about who can and can’t unlock your device (well, not yet: Give it 20 years for them to catch up). Since using Touch ID my hands get a weird tingly sensation that’s scary. I have TouchID disabled completely… yet every morning when I turn my phone on it whines at me that it can’t enable TouchID. I want it to stop trying. If I could remove the feature, I would. Well, Touch ID is neat but not always reliable, especially if a hardware issue is looming. You might want/need to deactivate Touch ID because your Touch ID sensor died, or your home button was repaired / replaced, but not by Apple, so Touch ID won’t function. Perhaps a new phone isn’t in the cards at the moment. But even after I shut everything down in the IOS settings as shown above, requests for Touch ID authentication in the Dunkin Donuts app; Touch ID also has to be turned off there, and other apps might be similar. I have always needed special procedures to capture the ridges on my fingers for state licensure as they are so negligible. Therefore, I can’t use touch id.